In India, which is home to half of the world's tiger population, the latest census in March 2011, revealed the presence of an estimated 1,706 tigers, way down from a healthy 45,000 population about 100 years ago. 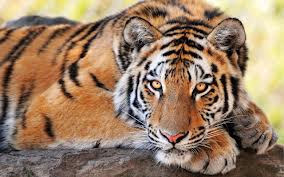 Tigers are mercilessly poached for their skin, claws and bones, all sold for its medicinal value in countries such as China and also in the west. Parts from a single tiger can fetch as much as $50,000 in the black market. However, there is some encouraging news. Officials at the NagarjunasagarSrisailam Tiger Reserve ( India ) said tiger movements were caught on camera recently in and around 800 square kilometers of NSTR, which experts said were signs that the population was doing well. At least 5 males and 10 females, apart from 3 cubs aged over a year old were caught on camera in the core areas for the first time in the last few years. Buoyed at the good news, NSTR officials said they are planning to purchase 210 cameras so that 800 square kilometer area can be covered at one go. Officials also plan to scout at least 2,000 square kilometres area of the reserve before the onset of monsoon and complete rest of the area later. This scientific mapping exercise is being done under phase-4 of intensive tiger monitoring under the ministry of environment and forests. Experts said special care must be taken to protect the cubs as the mortality rate is often very high.